With over thirty years of experience, we know only too well how important is to provide a good service that is recognised for its quality. Every effort is made by us to see that our prices are fair and competitive. Additional items valued at the same time will be charged at half the above fees. Instruments and bows already recorded with us can be updated (written update) at any time for a fee of £15. Instruments and bows bought from us may have their values updated and increased free of charge. The above prices do not include VAT which must be added at the current standard rate. Clients who purchase an item from us which in value, exceeds £5,000, are entitled to a certificate of authenticity which includes full colour photographs. There is no charge fro this service. We are also able to supply a certificate of authenticity for owner's own instruments or bows which were not bought from us. The cost of this service, which includes the valuation of the item, the preparation of the certificate with full, endorsed, coloured photographs is 3.5% of the value of the item plus VAT. Every instrument or bow bought from us will be issued with a condition report, unless of course it is in a mint condition. It will give precise details (including an illustration) of every repair and restoration we are able to detect. Protect your valuable instrument or bow with an up to date, professional valuation. 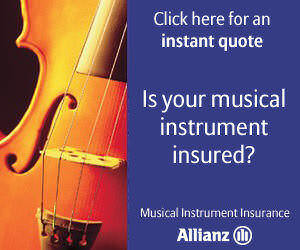 Blackburn Stringed Instruments has been a main agent for the Allianz (formerly British Reserve Insurance - part of the Cornhill Group) for over 25 years and can offer a highly qualified service. Any client who bought an instrument or bow from us previously and wishes to upgrade that item (or go to a larger instrument or bow in the case of a young player) and is able to find that item from us can, if they so wish, put in part exchange the original instrument or bow, at the price paid, provided no repairs have been done to the item in addition to those stated on the original condition report (excepting minor wear and tear). A printed pamphlet is available, which gives a lot of helpful and necessary information on keeping an instrument in first class condition and particularly indicating the correct way to attach strings to pegs. The content can also be found on our instrument care page.